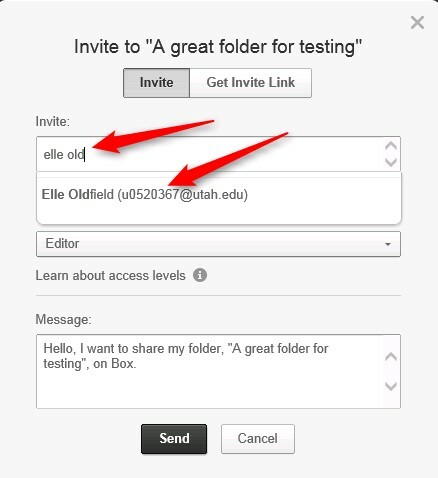 This tutorial will show you how to share files and folders with other University of Utah Users. This tutorial assumes this is not your first time logging into Box. For help setting up your Box account proceed click here. Now onto sharing: Go to http://box.utah.edu/ and Login. These two folders show the blue sync icon. This means these folders are synced to your desktop sync app. Important note before proceeding: When sharing with other U of U employees one must make sure they share in the following method or your fellow U of U collaborators will not be able to access your files. Do not type the email address of other U of U users into the Invite field. You will only type the users name or Uid. Now that you have selected the user you want to share with you can click the “Send” button or repeat setup 9 and add another user. When finished click “Send” to send the shared invitation to the user. You have now successfully shared a folder. 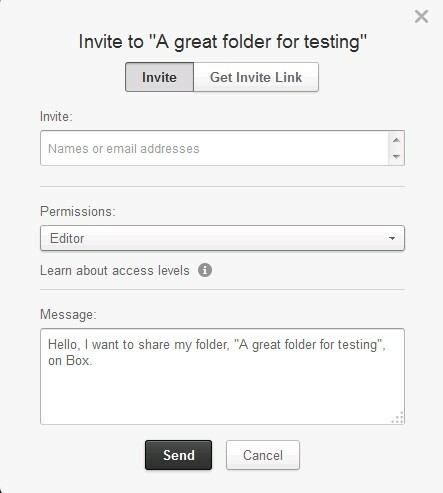 The users you shared with will get an email and a notification at http://box.utah.edu/ that a folder has been shared. For additional help with Box including more information on sharing and permissions please call 801-581-4000 Option 1 if you are a student. If you are a Health Science Employee/Faculty/Staff call 801-587-6000.